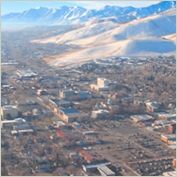 Learn more about Carson City, Nevada using the City Guide below. Plan a trip, find local shopping centers, or just discover what makes Carson City, Nevada so great! Carson City is the capital of Nevada. It is located in the Carson Valley, just east of Lake Tahoe. RTC RIDE is the public transit service for the greater Reno/Sparks community provided by the Regional Transportation Commission (RTC) of Washoe County, Nevada. Fares for adult is currently $1.75. Free transfer obtainable by paying your fare on-board. Q's Barbecue, best western style barbecue cuisine in the region. Best Western Carson Station Hotel/Casino, 900 S Carson Street, +1 775 883-0900 (toll free: +1 800 501-2929, fax: +1 775 882-7569). Best Western Pinon Plaza Resort, 2171 US Highway 50 E, +1 775 885-9000 (toll free: +1 877 519-5567, fax: +1 775 888-8003). Best Western Trailside Inn, 1300 N Carson Street, +1 775 883-7300 (fax: +1 775 885-7506). Holiday Inn Express Hotel & Suites, 4055 N. Carson Street, +1 775 283-4055. Motel 6, 2749 S Carson Street, +1 775 885-7710 (fax: +1 775 885-7671). Travelling to or from Carson City, Nevada? Find flight to or from Carson City, Nevada with an Online Travel Agency. Get lodging information or make reservations with a Local Online Hotel. Plan ahead and reserve a car with a Local Car Rental Agency. Are you relocating to Carson City, Nevada? Goods & Services in Carson City, Nevada.